For most competitive games, the players aren’t the only draw that brings in the viewer numbers. Broadcaster talent, voices like that of Dan “Artosis” Stemkoski or David “LD” Gorman, can often have an equal or at times even greater effect on viewer numbers. A top-tier broadcast makes an otherwise unremarkable game feel like the International Grand Final, and a poor one makes viewers shut off the stream in disgust. For better or worse, casting has become an inseparable part of the “esports” package. But the FGC isn’t exactly esports, now is it? If you turn on a fighting game stream, you’ll get a very similar production: a couple of broadcasters at a desk commentating each match. That’s how it is in traditional sports, in esports, and in fighting games. 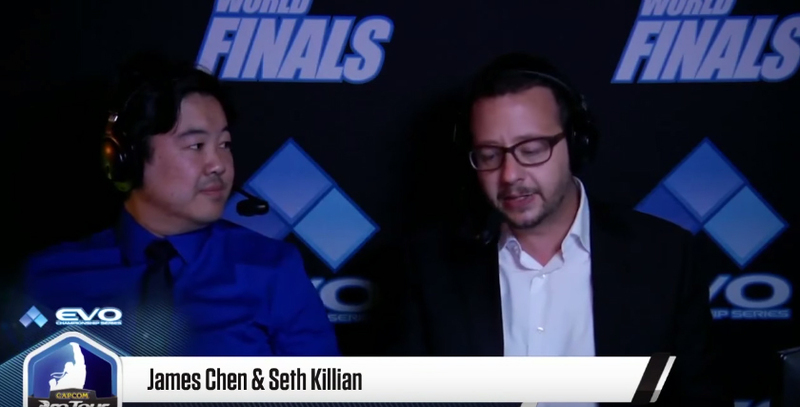 But I had the opportunity to attend EVO for the first time earlier this summer, and I was shocked to find that at no time were the casters’ voices broadcast inside the venue (except for in the overflow room). When you’re watching fighting games live, it’s just you, the crowd, and the players. And once my moment of confusion wore off, I realized I wouldn’t have it any other way. Most competitive games are complicated and unevenly paced. In StarCraft, there are even matches where almost nothing happens for the whole first 10 minutes. It’s the caster’s job to keep the viewer from getting bored during downtime, and to make the more complicated aspects approachable for viewers of all skill levels. A good caster will use that 10 minutes of buildup to explain the significance of the match, to build up the players’ stories, and to draw you into the game. And as the game goes on, the casters draw up the narrative of the match: raising the stakes for each play and building the tension right until the game hits its climax marked by a sudden burst of emotion. Fighting games don’t have any of that. There’s no build up, no 10 minutes of laying the groundwork for your strategy, and no down time. It’s two players face to face, with complete information, punching, kicking, and shooting fireballs at each other until one of them runs out of HP. It’s just that: a fight. Fights are universal, raw, and simple. Whether you’re a player working on your FADC option select or you’re a player who doesn’t even know what those words mean, it doesn’t change the thrill of watching an incredible combo, a footsies stand-off at low HP, or a come-from-behind bracket reset. You don’t need someone to explain these things, and they’re coming at you one right after another with just enough time to catch your breath. This lets the audience focus on just that – the gameplay. They don’t need to be told when to cheer, and they don’t need a caster to tell them that what they’re seeing is awesome. They react to the gameplay itself, throwing their hands in the air to “raise the Rufus” or cheering in rhythm as Jigglypuff jumps on and off the stage. It makes the whole affair feel more personal, and it feels much more of a celebration of the game itself. When the audience cheers the winner of an EVO, it’s not because of their history or the struggles they’ve gone through to get to that stage. It’s because on that day, in front of that crowd, they were the best. The reasons for this difference are pretty clear, and it comes back to the fundamental differences between “esports” and fighting games. Fighting games are a game of perfect information, so there’s no need for an observer; everyone can watch the same screen the players are playing on. The culture that pervades the FGC so strongly to this day was built up in the arcades, where people huddled around the cabinets to look at those screens and cheer on their favorite players. On top of that, all those viewers were probably there to play themselves. The action was always right in front of you and you understood the game just fine, so you never needed someone to explain it. And it’s for the same reasons why traditional sports – basketball, football, baseball – don’t have in-venue casters either. The crowd isn’t used to it, doesn’t expect it, and doesn’t need it. Things have come a long way since the arcade days, and there’s more crossover between the different competitive communities than ever before. But the things that make each community its own animal still hold strong to this day. The community leaders know what their players are looking for, and rather than change themselves to be more palatable for the newcomers they show them what the hype is all about. So even though someone new to fighting games, like myself, might be caught off guard now and again, it doesn’t take long to figure it out. Even so, casting absolutely has its place. In games with downtime and complicated strategy, the casters are vital to keeping everyone engaged from start to finish. And when you’re watching from home, they help you get invested in the absence of the venue’s energy. Being a part of a massive hyped-up crowd is enough to sustain your engagement on its own, but a stream with only game sounds is definitely a lonely thing to watch from home. And that’s where traditional sports, esports, and fighting games all agree. Ultradavid, Yipes, Prog – the best announcers in fighting games are every bit as good as the ones in the other communities, and their voices reach the ears of tens of thousands every event. They just fill a slightly different role and are happy to do so. Honestly, I’d barely even given the idea of caster-free venues a second thought before attending EVO. But completely understood as soon as the first match started. It was a Guilty Gear Xrd -SIGN- bout between two players I’d never heard of in a game I’d never played. Once the punches started to fly, that didn’t matter. I was cheering and gasping with the rest of the crowd, marveling at the beauty of the play I was seeing. It would’ve been cool to know that I was watching the “greatest GG player in the world,” or to hear how some of these combos and special moves worked. And yet, I didn’t mind not knowing. The clash of brilliance I was seeing on screen told me all I needed to know.